I was told that if the weather was unseasonably warm for a few days, there was a chance that my beloved mallard hen Honey would return to our pond. And, sure enough, it’s been over 90°F for four days in a row. Every day since I’ve been back, regardless of the temperature, I’ve gone out to the pond and whistled for her, all to no avail. I have to admit that I was a bit relieved when she didn’t come, as I was hoping she’d fly south. But I’m told that some mallards overwinter in this area (although in larger bodies of water that don’t freeze), and that she might come back for a visit. Naturally, I had to go back to my lab and break open my saved bag of mealworms, and she got a fine treat. I’ll see if she’s here today, and will feed her if she is. Then I’ll have to go to the store to buy frozen corn. Truth be told, I do love this duck, but I don’t want her to hang around when the weather gets cold. She’s still a bit skittish, as if she went feral after her ducklings fledged (she used to eat out of my hand), and my delight at seeing her is tempered with typical Jewish tsouris about her fate. Oh, duck experts: how do mallards manage to find their way back to a small pond like this when they’re far away? This entry was written by whyevolutionistrue and posted on September 25, 2017 at 7:30 am and filed under ducks. Bookmark the permalink. Follow any comments here with the RSS feed for this post. Both comments and trackbacks are currently closed. I hope this doesn’t become a Dangerous Attraction scenario. I think you may have what we call a local duck. No expert mind you, but we had lots of Canadians who will spend all spring summer and fall at the lake. Only when things freeze over do they leave and go far enough south to find water. If they were born of another local they will be local. They do not know how to migrate. This is like a soap opera: repetitive plotlines where characters disappear, supposedly forever, only to return; a couple dramatically splitting with no possibility for reconciliation…until they reconcile, of course. Next, Honey will come down with amnesia, but then five months later will regain her memory, only to realize that Jerry had been seeing other ducks all along. Then Honey will poison Jerry so it looks like suicide, knowing that Jerry’s father has a fortune from the oil wells he found on the Texas properties he bought back in the 1940’s, and the father has been close to death for years now due to a rare and incurable disease. But before Honey can get the inheritance, Jerry’s father makes a miraculous recovery, and it turns out he had hired a private investigator months before and known everything Honey was up to since she killed Jerry (Jerry’s father knew it was suspicious, as his son never liked split pea soup, which is what Honey told the investigators she had been feeding Jerry before he died). So Honey goes on the run to Argentina with her Latin love Enrique Quarazon, but in Panama, Enrique’s secret criminal past catches up to him, and he is pulled into the life of crime he tried to leave so long ago, putting both him and Honey in danger. Stay tuned for what will happen next week on the longest-running daytime soap, The Heart Never Knows. Oh man, I could seriously do this for hours. Yes you should. You’ve found your calling. I enjoyed that BJ. 🙂 I’m glad I didn’t have to watch it on TV though – that would’ve taken years to play out! Hahaha about 18,000 episodes, give or take, with the same storyline repeating over and over…and over again. BJ’s got it down pate. You have ‘Duck-Charm’ Jerry. As much as they may want to stay away, they can’t help themselves and in the end they always come back to you. I have the same relationship with fleas. Perhaps during her absences she has scouted and found a larger lake in the area to overwinter. Well, Lake Michigan is very close. Man, can you imagine over-wintering on Lake Michigan? “Damn cold” would be an understatement. If you love that poor duck, toss her in the trunk of your car and drive her to Florida. She wouldn’t be able to find her way back! This story made my heart smile!!! Interesting side note: During an earthquake, there is a shift in the magnetic field (which also plays a role in birds’ navigation) and that can throw birds off their trail. Our parrots actually lose their balance and fall off their perches and freak out during an earthquake because the magnetic shift affects their balance. While humans’ balance is auditory (inner ear), birds’ balance is ocular. Wow! That’s awesome! I hope she leaves before it gets cold too. Why leave? Not good news for the rest of us. Inexplicably, seeing “My duck came back!! !” when I logged on to this site today, made my eyes well up a little. Clearly, I need to get out more. That was my favourite song for a while when I was about 18/19 and had just broken up with my first really serious boyfriend. I’d forgotten all about it. Thanks for making my day, Dr. Coyne. When the temperature drops, I imagine Honey will find a temporary abode elsewhere, but I’m certain your pond will always be home. Here’s Dean Martin singing “Honey” https://www.youtube.com/watch?v=KRD5P3llYNs — a plaintive, dare I say, maudlin, ballad, but apropos. I gather that Bobby Goldsboro is the crooner of record for this song, but Deano is my guy. I debated how to spell it, but did not check beforehand, but thought that “Dino” would be read as short for “dinosaur” (reptiles or kale), so went with “Deano”; but now see that “Dino” is indeed correct. Glad we straightened out that critical distinction. I was walking in Eldridge Park today (Elmira NY) and saw a mallard with 5 babies and it made me think about whether you’d seen Honey since your return from Poland. I saw a mallard with chicks this time last year also and I’m still wondering if it’s way too late for babies to grow and migrate given it’s 9/25. I thought last year was just an anomaly, but, now I’ve seen baby ducks again this year in late September (in Elmira NY). Yay for Honey! She doesn’t want to leave you and your yummy offerings. to swim in my garden pool. Put some cover over the nest, she makes another. her voluble strength as a mother. But where is the mallard she quacks for? Where? the handsome green-capped bird, the missing mate. As much as I love it when people have a friend they can love, I worry about the health of the duck if it doesn’t get shelter for the winter that makes sense for its species. Me too. I doubt Honey can survive a winter in Chicago, and she should be migrating by now. 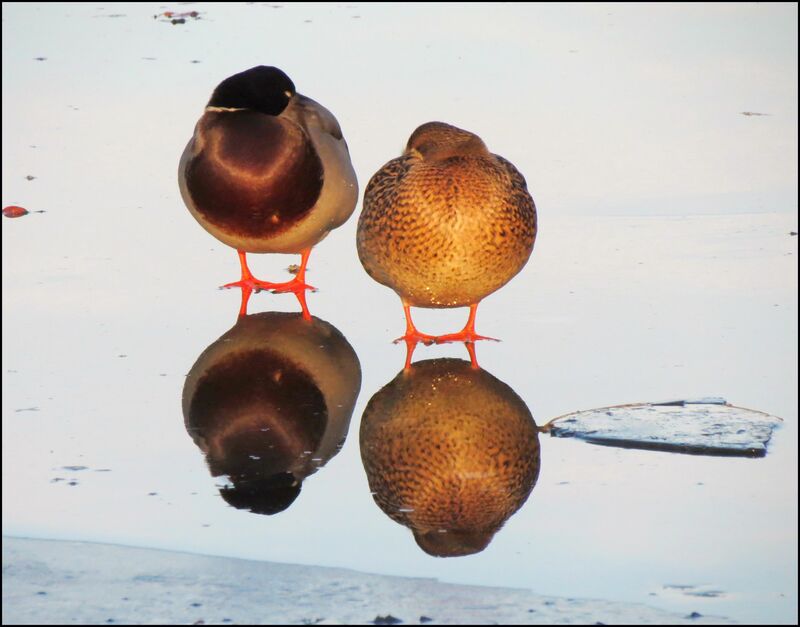 If it shows up, an old (2013), not-so-great pic of a mallard pair standing on frozen ice on a lake, January, Kalamazoo Co., SW Michigan. Mallards are strongly migratory. Sure, if they are fed they may not migrate, but it will not be good for them. I’m not sure where you’re getting your information from. Dunno if these links will work–BNA is a subscription site, but usually allows a few free looks. Mallard. Figure 1 . Along southern coast of Alaska, s. British Columbia (north to Stuart Lake), locally in s. Alberta (Edmonton, Wabamun Lake, Forestburg, Stauffer Creek, Dickson Dam, Medicine Hat, Calgary, Waterton Lakes, Fort McMurray), s. Saskatchewan (mainly Regina; local north to Cold River and Squaw Rapids), s. Ontario (north to Ottawa), sw. Quebec (Montreal), and locally in Maritime Provinces; south throughout U.S.; except mostly absent or very rare in Chisos Mtn. region of s. Texas and in s. Florida Peninsula and Florida Keys (Godfrey 1986, Andrews and Righter 1992, Robertson and Woolfenden 1992a, Semenchuk 1992, Smith 1996b, American Ornithologists’ Union 1998a). Also winters in n. Mexico within breeding range in nw. Baja California, along Pacific coast of Sonora and n. Sinaloa, in interior from n. Chihuahua to n. Zacatecas, and from ne. Coahuila to n. Tamaulipas, but formerly more numerous in Mexico (Howell and Webb 1995). Hmm. So I guess I (and Holden Caulfield) have been worrying needlessly. Jerry, you better buy a kiddie pool to keep your duck inside this winter. I think all that food bought you a full time duck. Why would she risk that long flight south? As another duck lover, this is heartwarming. After all these years (9 to be exact) I still reflexively keep 5% of an ear tuned for the plaintive quack of our little long lost mallard. That tender spot left behind when she flew off never healed fully.